As the saying goes; “History often repeats, but is never exactly the same.” The same can be said for asset classes, if one understands their long term cycles. Let’s examine Gold. Because futures trading is such a hyper-leveraged zero-sum game, futures traders have a reputation of being smart and sophisticated. And they are to a great extent, futures are so unforgiving that survival of the fittest rules. Capital naturally flows from the poor traders to the good ones. Nevertheless, within their chests thump the same hopelessly emotional human hearts that are such a liability in the markets. The future price of gold cannot be discussed without considering its implied discount rate expressed through time-preference. This is the relative desire to own goods at an earlier date rather than later. There are several reasons gold is almost certainly more valuable sooner rather than later, including the fact that when someone wants something he naturally wants it now, and there is always the risk that a promise for future delivery will not be kept. Encompassing the year end and its holiday on Wednesday, this week has been notable for precious metals. For gold there have been three important features: firstly, Tuesday saw a powerful one-day reversal, with gold falling $22 before recovering by $32; secondly the $1182 low was first tested six months ago before rallying strongly to $1430, and it looks like gold might be forming a double bottom, the prelude to the next bull leg; and lastly this happened on the last trading day of 2013, which suggests that the fall in price had more to do with window- dressing rather than genuine selling. The last time housing market sentiment and precious metals prices lined up this way, we were on the cusp of massive volatility and collapse. Housing had reached the end of its long great credit driven rope. At the same time, defaults began to create tremors deep below the house of cards. Silver and gold had recently been pummeled in the same not-for-profit manner that has riddled these markets for more than 40 years in the modern era (and perhaps much longer throughout the history of the monetary metals). Currently, commodity price performance has lulled the speculative (and therefore, the mainstream) community into a sense of complacency. The speed with which accidents can happen and induce overall change in sentiment is something which can only be imagined in the context of the flash crashes. Outside of more circuit breakers, the HFT conditions that ultimately led to the May 2010 fat finger flash crash and its reverberating damage have not been resolved. In early November we turned bearish on the precious metals with the expectation that the sector was about to begin a final plunge that would lead to a V shaped bottom. In our last editorial, we asserted that the bear market was in its final throes. Interestingly, the plunge in precious metals stocks may have ended in early December. Over the past several weeks the gold and silver stocks failed to break lower despite the negative sentiment and the prevalence of tax loss selling. 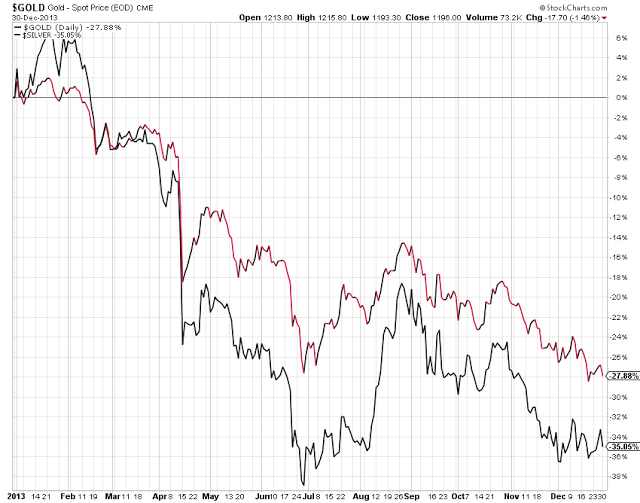 While we aren’t sure if Gold has bottomed, we think odds are strong that the stocks have bottomed. If you're like me, you've bought gold due to the money printing policies of most developed countries and the effect those policies will have on the future purchasing power of our paper money. Probably also because there's no viable way for governments to escape the consequences of all the debt they've piled up. And maybe because politicians can't be trusted to formulate a realistic strategy to avoid any number of monetary, fiscal, or economic crises going forward. These are valid, core reasons to hold gold in a portfolio at this point in time. But a new trend is under way, and someday soon it will be just as much a driving force for gold prices as anything else: a good old-fashioned supply crunch. There are two types of gold investors: those trying to make money on short-term market timing and those looking for long-term asset preservation. It was the fear-driven trading of the former that helped gold break $1900 in 2011, and for good reason - stormy markets steer investors to safe havens. But gold's fortune has shifted in the past two years, and finishing 2013 down 28% seems to have sealed its fate - at least in the eyes of the short-term speculators. In reality, the same forces that are stabilizing stocks and suppressing gold are also the fundamental reasons long-term investors have been buying gold since the turn of the new millennium. The so-called recovery we're now experiencing is just a lull in a storm that hasn't yet abated. The Internet has been spotty, the phones are out, and the only people who can fix it are "off island" for the holidays. Of course, Marina and I can hardly complain. The temperature is in the low 80s, the rain falls after dark, and the friends we have built up over more than two decades are here to ring in the New Year. No nightly raid so far tonight Wednesday Jan first. This is an update from the last report, the ideas still appear to be working so little has changed from the last report, and many stocks appear to still need a bit more downside. I will keep it brief as usual and let the charts explain the ideas, with a little commentary. The big theme going into 2014 is to be looking for an intermediate low on many Gold stocks, both Gold and Gold stocks in my opinion are much closer to a substantial low and one that traders can look to trade, than more downside, many of the Gold stocks have been completely destroyed, so I suspect we have limited downside based on the patterns and the potential for some decent upside moves. Although we will need to see Gold put in a low and finish a suspected 5 wave decline from the 2011 high, Gold currently appears to be in wave , so a target of 1150-1180. Gold's been frustrating, to say the least. Plus, its characteristics changed in September. The drain of gold from the Western ETFs and Funds is apparent. About 942 net tonnes have been removed. This compares to the 856 tonnes that had been removed as of mid-December. 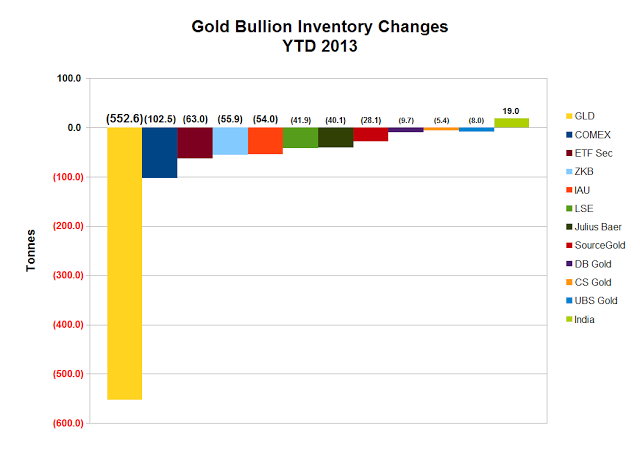 That is quite a bit of bullion moving out in just a few weeks. 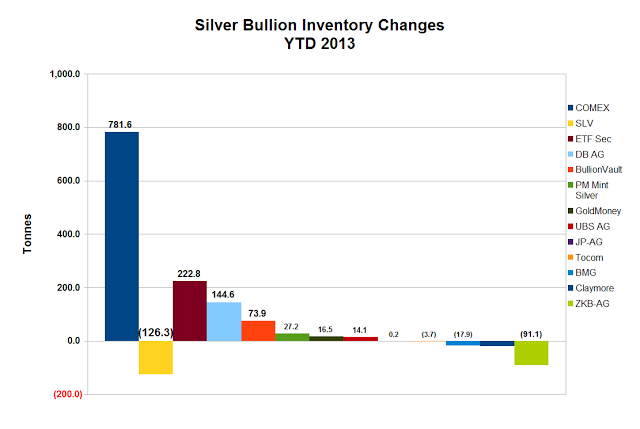 But even more notably, this is in sharp contrast to silver, which has had about 992 net tonnes added. On a percentage basis silver has had a worse price performance this year compared to gold, so ascribing this to investor preference seems a bit thin. This is certainly an interesting phenomenon. It will be worth remembering I suspect. There seems to be little question that the gold market is being manipulated by some big players. And there is certainly quite a bit of precedent for this manipulation. The bigger questions are the motives, and the course of the endgame, this time. All manipulations end, eventually. Where were they dumping it, into the ocean? All this gold, that no one seemingly wants, and yet the New York Fed cannot find enough bullion to return Germany's gold, and for seven years. What about the gold they hold that no one has yet asked about? No, the gold has been moving from the custody of GLD as Authorized Participants, aka the usual suspects, redeem bullion from the ETF, and send it elsewhere. Where does this all lead? Follow the yellow brick road, or more appropriately, the river of gold. Judging from the overall import and export numbers, it is quite the golden river, flowing from west to east. It is caught in the tide of history, as are we all. These figures are from 12/31/2012 through 12/30/2013 and are courtesy of Nick Laird at Sharelynx.com. Remember the outrage last July when we found out owners of giant metal storage warehouses, folks like Goldman Sachs and JPMorgan Chase, were delaying delivery of stocks of aluminum so that they could collect more rent on them? We learned that, since Goldman took over some industrial warehouses in Detroit, the delivery time for aluminum went from six weeks to 16 months. There was one news headline recently that was quite conspicuous, however. A news site known as the Deccan Chronicle (www.deccanchronicle.com) published a story on Dec. 25 entitled, "Lift of import curbs may crash gold prices." The story was in reference to the Indian government's proposal to relax import duties on gold. Dharmesh Bhatia, of Kotak Commodities Services Ltd., was quoted in the article as predicting a gold price crash if the Indian government removes the duties on gold imports or even relaxes the curbs significantly. The coming explosion in the value of silver will be a shock to the world due to the failure of the analyst community. I am completely amazed at the lack of quality analysis today. Except for a few good analysts, there's a sea of lousy ones who continue to put out work that becomes increasingly worthless each and every passing day. While we can totally write-off most of the forecasting that comes from the MSM - Main Stream Media, I am quite surprised at the amount of garbage coming from the alternative media. I don't mean to be blunt here, but sometimes it's best to be honest.